Ideal for helping you find where you need to spend your time when you are out fishing, a fish finder is a small device that relies on sonar waves to help you see where there are fish. This way, you do not waste your time in an area where there aren’t any fish and can make sure that you optimize your time on the water to help you catch the most fish possible. These instruments are created with the sole purpose of detecting fish under the water’s surface and are great for anyone who is unfamiliar with an area, has a limited amount of time that he or she can fish, or wants to bring in the most fish. Both beginning fishermen, as well as professionals, can benefit from the additional help that they will receive when they use a great fish finder. That is why we have decided to compare the Humminbird Helix 10 vs. the Humminbird Helix 12. The best way to compare different types of fish finders is use to a point system. This makes it easy for everyone to understand where the various fish finders rank about each other. By comparing the following fish finders and discussing three main features, shoppers can make the right decision without any stress. This means that you’ll have the right fish finder for your needs and won’t pay a lot for extra benefits that you won’t need. It’s important when you choose a fish finder that you buy one that has enough power for your needs. The strength of fish finders will be measured in wattage, and this is a great way to compare different fish finders. Lower-wattage fish finders will be slower and are better used in shallower water as they won’t have the power to read deeper into the water. Higher-wattage fish finders have more power and can display readings much faster, making them great for use in deeper water. The depth of the water where you will be fishing will play a huge role in what wattage you need. With up to 8000 watts, it’s easy to see why so many people love this fish finder. It has much power to ensure that the picture you see on the screen updates quickly and can penetrate into the deep water. You’ll be hard-pressed to find water that doesn’t look great on this fish finder. The CHIRP sonar on this fish finder allows it to have up to 8000 watts in power output, which is just astonishing and enable it to be used in very deep, turbulent water. You won’t ever have to worry about whether or not you are going to be missing a fish in the water when you use the Humminbird Helix 12 as it has more than enough power. It’s essential that you take into consideration the watts of the fish finders you’re comparing, as this will have a massive role in how powerful your finder is. Without the correct wattage, you won’t be able actually to see the fish that you are trying to catch. The Humminbird Helix 12 is the clear winner here with high wattage that makes fishing not only fun but also relaxed. It’s great for amateur fishermen as well as those who have a little more experience and who want to make sure that they can get the catch of the day. The right frequency will ensure that your fish finder is working the best that it can. Higher-frequency fish finders will be able to show a lot more detail on your screen, making it easy for you to see the water bed. The higher the frequency of your fish finder, the more sonar waves that are being sent into the water and then received by the finder’s transducer. Low transducers, such as ones around 50 kHz, are excellent for professionals to use in deep water but if you are in the shallower water, then look for one around 200 kHz. This fish finder supports a number of different frequencies with the sweet spot being 83 to 200 kHz, as with most other fish finders. The Humminbird Helix 10 can operate from 28 to 250 kHz, allowing you to see well into the water with plenty of detail so that you don’t have problems identifying parts of the water bed and fish. This fish finder can operate with non-modulated frequencies of 83/200 kHz. By using conical beams, it offers great vision in any depth. In addition, the Humminbird Helix 12 does a great job showing target separation so that users can easily distinguish what they are looking at under the water without any problems. While most dual frequency transducers have 60 and 20-degree cones, not all do so you have to pay attention when comparing frequencies from one fish finder to another. The type of frequency that you choose will depend on what kind of fishing you are planning on doing as well as the water depth. That being said, the clear winner is the Humminbird Helix 12 as it works well in all kinds of water and is incredibly powerful so that you can easily see the fish below you without any problems, unlike the competitors that don’t have the same amount of power. While for many products bigger isn’t better when it comes to buying a fish finder, you want to make sure that you can see all of the detail on the screen. This is especially important if you have bought a fish finder with a high frequency as it will give you much detail from the waterbed; however, if your screen is too small, you will not be able to see the details and tell what is under the water. While some fish finders have very large cases, if you want detail, then you need to be more concerned with the size of the screen. The Humminbird Helix 10 has a screen size of 10.1 inches, giving it a definite improvement over other past models but still making it smaller than some fish finders. A larger screen makes it much easier to see under the water and make sure that you don’t miss any fish when you are out on the water. The screen on the Humminbird Helix 12 is 12.1 inches, giving users a fantastic view under the water and allowing them to quickly see where they need to go to have the best chance of catching fish. This screen also has an LED backlight so that it can be used at any time day or night without problems. Without a screen that is large enough for you to see what is going on beneath you really, you’re going to have trouble finding the fish that you’re looking for. This is why it’s so important to consider screen size. While it isn’t the most critical factor for most people, if you are aging or have problems with your eyesight, then you will want to make sure that your screen is large enough. That’s why the Humminbird Helix 12 comes out on top. Its large screen makes it perfect for any fisherman to see and track fish in the water. Overall, the best fish finder is the Humminbird Helix 12. Based on comparing screen size, frequency, and wattage, it’s relatively easy to tell why the Humminbird Helix 12 comes out on top. No matter if you are starting out fishing, have been fishing for a long time, or want to go professional, then it’s time to get a great fish finder. The right one will make fishing easy, fun, and exciting as you can easily track the fish in the water, see the water bed, and check out your surroundings before deciding to cast. It was a tough choice deciding between the Humminbird Helix 10 and the Humminbird Helix 12. In the end, there was one comparison that made our decision. 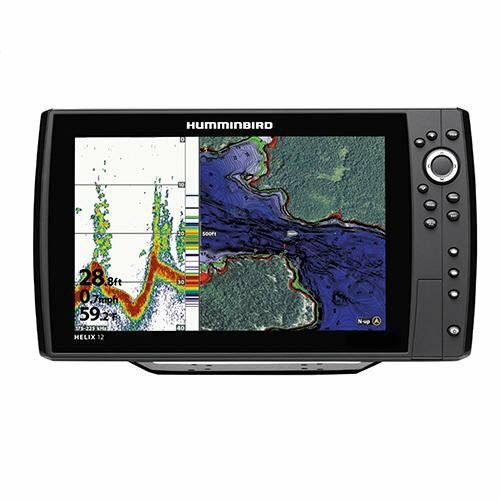 Although the Humminbird Helix 12 is superior to the Helix 10, it was not $700.00 worth of excellent so we chose the Humminbird Helix 10 as our recommended fish finder in our Humminbird Helix 10 vs. Humminbird Helix 12 comparison. 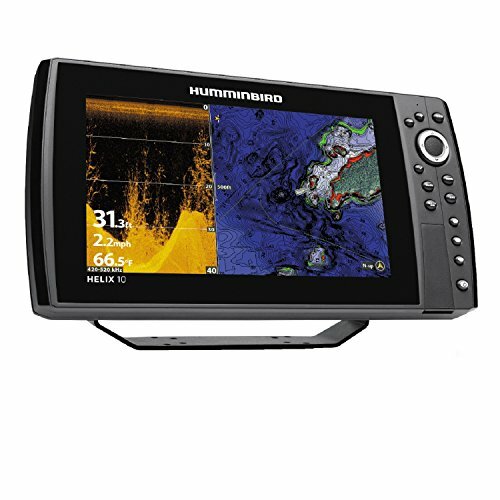 For More Information On Humminbird Fish Finders And To Find The Best Price Online, Check Out These Articles.